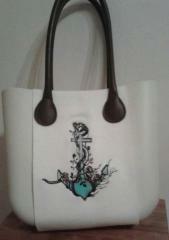 This austere leather bag made with monochrome colors looked very simple and ordinary before the decoration. But Dreamcatcher machine embroidery design turns it into a completely different thing: now it is the accessory for girl or woman who knows what she wants from her life but leaves the place for dreams in it. The picture of dreamcatcher made with the main colors of the dark part of this bag looks very organic on background of its white part. 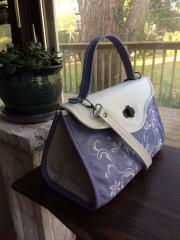 There is woman’s bag of intensive violet color with short and long handles. It is decorated with well made Pointe shoes machine embroidery design. The picture of dancers’ footwear is made with pastel colors of some shades of pink. The pair of shoes is completed by roses which accompany each successful artist. This embroidered sample is well located on the side of bag and makes it unusual element of wardrobe. This bag could look austere and even simple without the decoration by Anchor machine embroidery design. It is the stylized picture of ship’s anchor twisted by the rope, branches and roses. It looks like if it spent much time lying in the shallows. 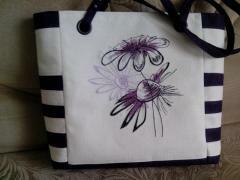 The thin geometric lines of this image make this embroidery sample graphic and the whole bag very elegant. It is almost monochrome besides the blue color of the anchor. This is pretty terry towel made by Janine Stewart from Australia. Author chose image from well known animation film for this work piece. 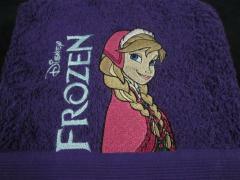 It is Anna Frozen 2 machine embroidery design. This figure is portrait of one of main characters from this cartoon. It is added by suitable inscription. This embroidered towel will definitely be liked by those who love this cartoon. 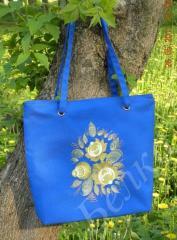 There is the summer bag made from the fabric of intensive blue color. Its front side is embellished by the expressive embroidered picture of splendid bouquet. It is executed with pastel color of delicate shades. 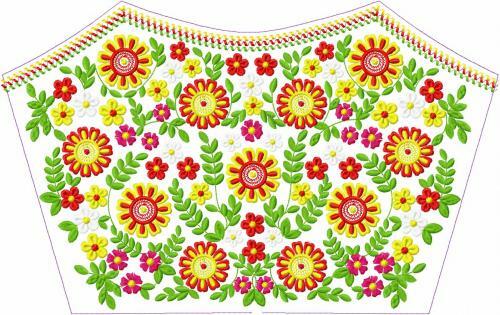 The manner of making Bouquet machine embroidery design on this bag reminds the style of traditional floral ornaments. Its location at the center of this textile bag makes it the most important detail of it. 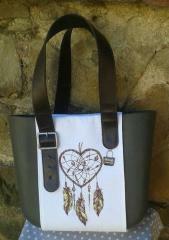 Here you can see the stylish woman’s bag made from natural leather of pastel colors. 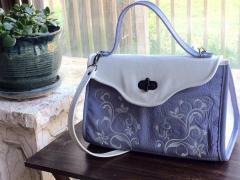 Its white cover and belt underlines the complex shade and original floral ornament on the body of the bag. 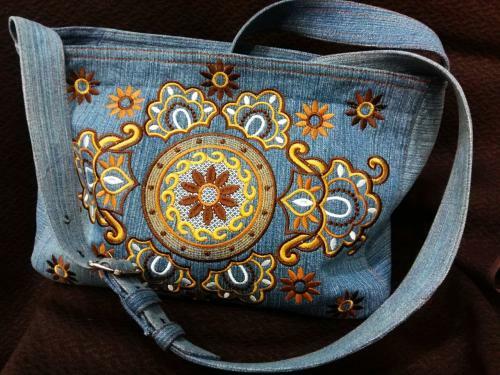 It is the original version of Green swirl free embroidery design: the author chose blue thread for it to fir the gentle shade of the bag’s leather. So from the usual bag with simple design it becomes trendy accessory. This picture is the perfect illustration of importance of choosing right way to decorate the accessory. If you try to imagine this woman’s leather bag without embroidery you will definitely understand that it was quite ordinary and boring thing. 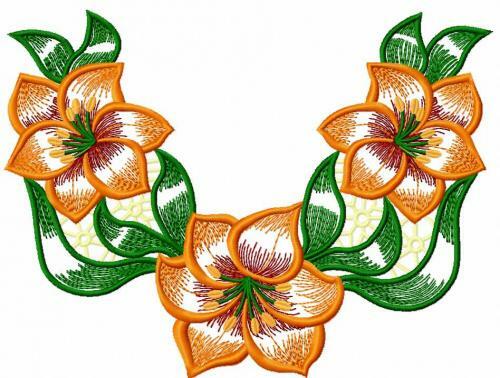 But with Green swirl free embroidery design it got absolutely different look. The floral ornament used for the body of the bag balanced the quantity of white color and embellished the whole work piece. This picture shows easy and convenient way to decorate any thing for child who loves cartoon cars. 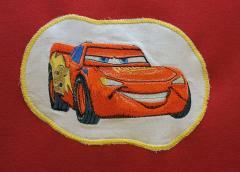 You just need to take Lightning McQueen embroidery design or other sample from our cars collection, execute it on separate piece of fabric and then fix and main work piece. 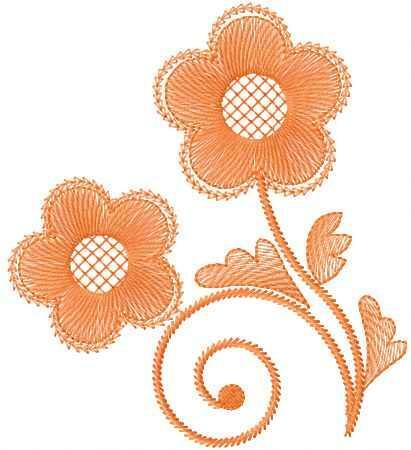 You can choose place and quantity of such embroideries in accordance with your own taste. This funny little car will be definitely favorite of all children who love cartoon cars. It is very difficult to hide smile when you look at its clumsy wheels reminding long feet of grasshopper. If you also like this embroidery sample and want to use it to decorate clothing or accessory for your own child take our Ramone embroidery design. 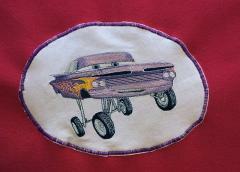 This is funny embroidered picture executed in appliqué manner. It is very good idea if you want to create cool and original thing for your child who loves carton cars. Furthermore it will not take much of your time. 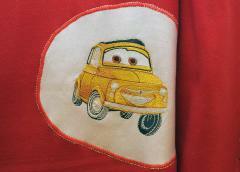 Just take our Mater Car embroidery design, make it on separate piece of fabric and then fix at main work piece. This picture shows fragment of fun and cool textile panel executed for decoration of child room. It is especially suitable for those children who love different kinds of cartoon cars. 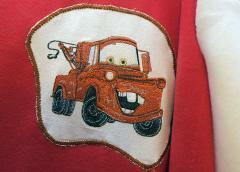 This one is executed on base of Luigi machine embroidery design. This is portrait of merry old car which seems to have some Italians roots in its interesting pedigree. This small pillow is the sample of easy but very expressive textile accessory which can be used as the last important detail for your interior. Its idea is based on contrast of brown and white colors which are used in background and embroidered picture. 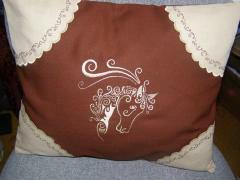 Horse head free machine embroidery design is the center of this cushion: it is the portrait of elegant and graceful horse made with just some white curves.